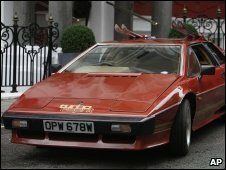 James Bond's Lotus Esprit from the film For Your Eyes Only has been sold to a Middle Eastern buyer for £105,000 at an auction in Oxfordshire. The sale at Blenheim Palace took place on Saturday. The auction firm Coys said the buyer was a telephone bidder. Two identical cars were supplied for the Production, but one was blown up during a stunt. The car was designed to be a less gadget-laden and more realistic than the elaborate models of the 1970s. It was the work of Lotus's own development team. Prior to its role in the Bond film, the car was used by Lotus boss Colin Chapman.